Based on Prosper Mérimée’s eponymous novella, Georges Bizet’s Carmen of 1875 is the story of the ultimate temptress. A gypsy and cigarette factory worker in Seville, Carmen has the power to entice any man she chooses. Once, however, they are besotted with her she quickly moves on, leaving them heart broken and unable to accept what has happened. In the opera Don José, an army corporal, has almost everything he could ever desire. He has the sweet, loving Micaëla who is more than willing to marry him, the blessing of his mother, a job he is proud of and the opportunity to see his home village. When Carmen decides that she likes him, however, he ends up sacrificing everything he has for her, and cannot accept it when she loses interest in him and turns to the torero, Escamillo. If Carmen hardly sounds a sympathetic character, she can certainly engage an audience with her allure and steadfast determination to live by her own rules. Freedom is the most important thing to her so that when Don José threatens to kill her unless she says that she loves him, she accepts her fate, preferring death to proclaiming a lie and feeling a sense of imprisonment. Barrie Kosky’s production arrived at the Royal Opera House last February, having first been seen at Frankfurt Oper in 2016, and it certainly divided opinion. The degree to which any individual enjoyed it seemed to depend on their ability to shed all hitherto held ideas regarding what Carmen should say or deliver, but this reviewer found it truly extraordinary. From that extremely high starting point, it does not have quite the same impact second time around, though this may be because, when novelty and innovation are so key to the production’s success, losing the element of surprise is a drawback. Nevertheless, this will not present any problems to anyone who has not seen it before, the basic strength of the production still shines through in exactly the same way, and the singing is absolutely outstanding. The opera is longer than usual as the production includes a narration that overall exceeds the length of the dialogue it replaces. This can break up the normal pacing, especially towards the beginning when some of the verbal ‘interruptions’ act as a check on the music building up momentum, but there is compensation for this. The pre-recorded narration is delivered by the Voice of Carmen (Claude de Demo) and so this puts her at the centre of events in every way, even though she describes those that directly involve her in the third person. The narration enables us to gain insights into many new areas including the pasts of both Carmen and Don José. Both of these are described in Mérimée’s original 1845 novella, thus helping us to understand more about the context in which the characters we see operate. However, one of the great selling points of the first production was that it included musical material that Bizet drafted for it but did not include in its premiere. This time around a substantial section sung towards the start by the corporal Moralès is cut. This may have been in response to criticisms that this music lengthened things too much, or that Bizet, by dropping it, did not intend it to be heard in the opera. However, one cannot help feeling that if this production is as intent as it seems to be on doing things differently, then this is precisely the type of thing that it needs to include. 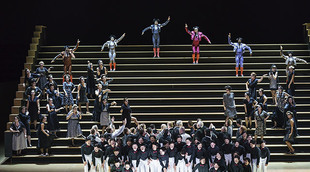 The stage is dominated by one huge staircase, courtesy of Katrin Lea Tag, upon which figures, including the entire chorus, can appear. The production also employs a group of six dancers, choreographed by Otto Pichler, and together these elements convey all of the emotion in quite a different way to normal. ‘Avec la garde montante’ usually sees the children take centre-stage, perhaps marching in a boisterous manner amidst a scene that is packed with colour. Here the children’s chorus (Covent Garden’s Youth Opera Company) simply stand on the steps so that, while they bob a little as they play their instruments, it is the dancers who provide the real movement. The fact there are only six of them means that the necessary exuberance is rendered in a more stylised way than usual, so that while the iconic ‘Les tringles des sistres tintaient’ is undoubtedly dynamic, it is still not the most frenzied or frenetic visual rendering of the aria. However, the spaciousness created by the vastness of the staircase, Joachim Klein’s excellent lighting, the production’s generally chiaroscuro palette, and the sheer slickness and professionalism in the movement mean that, even if not everything is entirely to a viewer’s personal taste, it is impossible not to see what is presented as a quality product in which class shines through. The degree of stylisation in the production also requires performers who can work with it while still ensuring that their characters remain convincing and emotionally powerful. Here, Gaëlle Arquez presents the full package as Carmen, replacing the previously advertised Ksenia Dudnikova for this revival although she did play the part for some performances during the original run. Her beautifully full mezzo-soprano is as nuanced as it is intriguing, while her demeanour highlights both the gypsy’s allure and coldness. During her encounter towards the end of Act II with Don José, she feels more cruel than most Carmens. In fact, when Micaëla appears in Act III she haughtily paces up and down suggesting that, much as it would make things easier for her if Don José were simply to leave, she does not really want to see him walk off happy with the other girl either. When she does finally order him to go, it feels entirely devoid of any patronising kindness that is normally present. 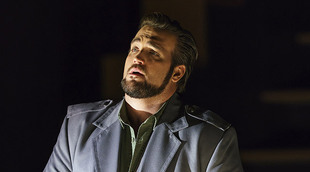 Brian Jagde excels as Don José as he reveals an extremely expansive tenor that is as impassioned as it is powerful. Alexander Vinogradov produces a brilliantly large and warm sound as Escamillo, and if he does not assert the character of the torero as boldly as some in ‘Votre toast, je peux vous le rendre’ (the Toreador Song) he certainly has his own presence. Eleonora Buratto as Micaëla sings ‘Je dis que rien ne m'épouvante’ beautifully as she really emphasises the bravery of this young person in entering the smugglers’ hideout to find Don José. In the pit, Keri-Lynn Wilson’s conducting also underscores the ultimate strength of the evening on what is her Royal Opera debut.